Greek Prime Minister came to Turkey after the official talks in Ankara, he started his private Istanbul travel last night. 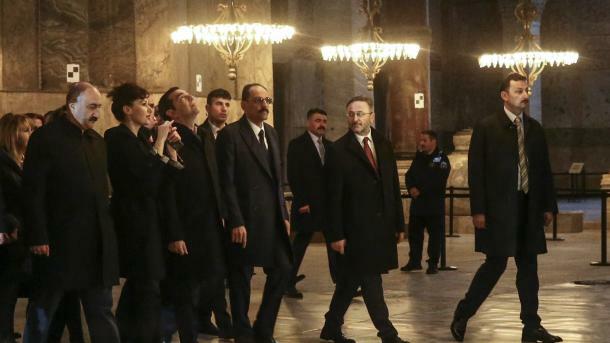 Çipras visited Hagia Sophia under intensive security measures and was accompanied by Presidential Spokesman İbrahim Kalın during his visit to Çipras. Çipras made a first in history. This was the first time he visited a Greek Prime Minister’s seminary. Çipras participated in the ceremony, which was directed by the Fener Greek Party Bartholomeos in the church in the Halki Seminary. Then, Çipras visited the garden and planted trees in the garden with Presidential Spokesman İbrahim Kalın and the Fener Greek Party Bartholomew. Greek Prime Minister Aleksis Çipras attended a service in the church of the Halki Seminary. The ritual was directed by the Greek Patriarch Bartholomew. After the ceremony, the Greek Prime Minister visited the school grounds. Here, Chipras planted trees in the school yard with Presidential Spokesman Ibrahim Kalin and Patriarch Bartholomew. Prime Minister Çipras, then toured the school and classes with his retinue. Çipras was the first Greek Prime Minister to visit the Seminary. In 1933, Elefterios Venizelos, who laid the foundations of the Turkish-Greek friendship with Atatürk and the opposition leader, visited the school during a special visit.